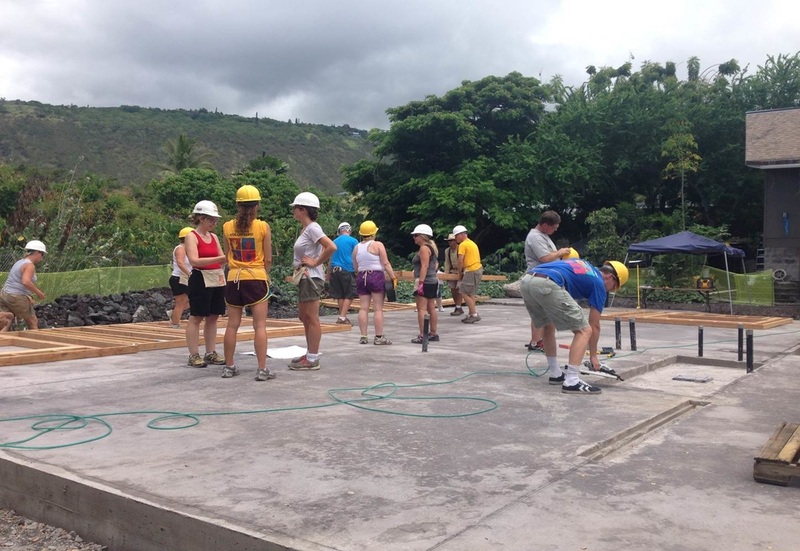 Volunteers are the heart and soul of Habitat For Humanity Hawai'i Island. Want to volunteer at one of our home construction or home repair sites? Help in the ReStore or our offices? It's easy - just print and fill out the form below. There are many positions available in construction at Habitat for Humanity! We need volunteers skilled in carpentry, electrical, drywall, plumbing, landscaping, roofing, and much more! Our build sites are typically active from Tuesday to Saturday, and we accept both skilled and unskilled volunteers. Volunteering in construction is a great way to work directly with the partner families, and help is always needed. After initial construction of our houses, both the inside and the outside need to be painted! A fresh coat of paint makes a huge difference in making a house feel like a home to our partner families. This is a great way to get your start as a volunteer at Habitat, if you're nervous about jumping right into a construction role! We don't just need help on our construction sites, there's also a lot going on behind the scenes! Data entry, newsletter writing, grant writing, and a lot more happen in our offices in Kailua-Kona, and we need help with all of it! Habitat has many committees that need input from caring community members. Some committees you could join as a volunteer are Building/Construction, Family Selection and Support, Fund Development, Special Events, and others. If you are interested in building Habitat up, then consider becoming a committee member! We have the best volunteers in the world, especially our construction volunteers, who work through the sun and the heat in order to bring a new home to a deserving family. Sometimes we need volunteers to help prepare and bring food and drinks to our work sites so that our construction teams can keep their energy up! Without them, there wouldn't be a Habitat for Humanity on Hawai'i Island, so we always need people who are willing to help us take care of them, in whatever way we can! Cashier: An important job for the ReStore. Cashiers are the last person that our customers see and the last impression the customer has of the ReStore. But this job comes with great responsibility above and beyond that. Attention to detail in ringing up customers, honesty in handling cash, and a sense of pride knowing that you are giving the best customer service to every customer! Receiving: Being wish the handling people and their goods is a unique quality. If you have that you may be the best receiver, and we are not talking about football here! This position has to be able to determine if we can accept donations being brought in. A keen eye is required to see if there are any damages, and knowing how to finesse it to a donor. Customer Service: Customer service is one of the most important things for our ReStore. Can you handle nice customers with the same skill set as handling those with a bit more "edge" to them? This can be tricky and requires patience. This does not mean you have to tolerate any abuse, but it means you know hot to calm a customer down, or know how to keep them happy! Pricing: Do you have a good sense of retail value? If you are a shopper at heart this may be your dream job! If you know the price of retail items, or know how to find them you will be a huge asset! We constantly want to make sure we are getting the best price for our items and make sure that we are not over charging our customers, but also making money to help build more homes for Habitat for Humanity Hawai'i Island. Merchandising: If you love to organize, decorate, and visually make our store appealing, then look no further! It is important for customers to be able to locate what they are looking for. If it even more important that it looks appealing and not be dirty or messy. So if you have a creative mind, give out ideas on how to improve the look and feel to our ReStore. We will welcome any realistic and cost effective ideas! Cleaning: If you love spring just so you can clean, then you will love this task! Every day we have "spring cleaning" opportunities. Whether it be donations that just need to be made store ready, or helping to make sure the store stays clean for every customer, you will never be bored!